This world needs more people to stand up for each other. See how the one’s are side by side in solidarity? Each time you see 11:11, stop and feel the rays of love seeking to reach you. Ask out loud for guidance to stay on your path. Ask for a miracle for yourself, and the world. Know that you are ready to manifest your desires on a grander scale. There are no limits to what can be done when you work with the Divine. We are each 1% bodies and 99% Spirit. Imagine what you could achieve if there were 99 more ‘yous’ on the planet!! WHITE LIGHT reduces to 11:11 in numerology, and this is what you are truly made of. 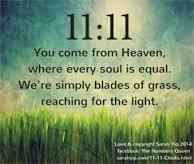 Seeing 11:11 indicates that you may have Master Numbers such as 11, 22, 33 or 44 in your soul contract. These give you double blessings and responsibility in certain areas of life (leadership, relationships and creative expression). You’ll often be a late bloomer as a result. Please read my 11:11 Clocks page or join my master numbers page on facebook (Lifepath 11) for more guidance on fulfilling your incredible potential. You can also ask questions on my community facebook page The Numbers Queen. Posting to the timeline is best. Feel free to book in for a reading or come and study numerology with me.